Deciding the W3B communications satellite leaked too much propellant to drive itself back into Earth's atmosphere, Eutelsat has abandoned the crippled spacecraft in the same transfer orbit it was left in by an Ariane 5 rocket. The Paris-based satellite operator safed the spacecraft last week, draining its electrical batteries and expelling helium pressurant to reduce the risk of a debris-scattering explosion in the future. The satellite never unfurled its antenna reflectors or its solar panels. Vanessa O'Connor, a Eutelsat spokesperson, said the company alerted the U.S. military's Joint Space Operations Center of the decision to help coordinate potential threats to other satellites in orbit. Engineers from Thales Alenia Space, the W3B spacecraft contractor, discovered a "significant" leak of oxidizer from the satellite's propulsion system almost immediately after separating from an Ariane 5 rocket after liftoff Oct. 28. The satellite, which weighed 11,839 pounds at launch, was in the upper position of the Ariane 5's dual-payload stack. W3B separated first from the launcher's Sylda 5 satellite adapter, which then jettisoned to reveal Japan's BSAT 3b broadcasting satellite. BSAT 3b was bolted to an adapter directly on the rocket's upper stage. Officials have reported no problems with BSAT 3b since its deployment. A joint inquiry including Eutelsat, Thales and Arianespace teams are investigating the most probable cause of the W3B mishap. Testing before liftoff showed no indications of a problem or leak. Eutelsat declared the satellite a total loss Oct. 29, a half-day after the flight was heralded a success in jubilant post-launch speeches at the Ariane 5 launch site in French Guiana. After considering moving W3B to a graveyard orbit or guiding the satellite to destruction over the Pacific Ocean, managers ultimately concluded their only option was leaving the spacecraft where it was. The satellite is orbiting Earth with a high point of more than 22,250 miles and a low point of 155 miles. Its inclination angle is 2 degrees to the equator. O'Connor said the spacecraft will remain in such an orbit for up to 25 years. The craft's high point, or apogee, is currently near the ring of geosynchronous satellites parked over the equator, W3B's destination before it sprang a leak. A satellite in W3B's orbit would naturally drift in and out of the geosynchronous ring, reducing the collision risk with operational spacecraft, according to Nicholas Johnson, NASA's chief scientist for orbital debris. Johnson said satellites in such orbits are susceptible to perturbations from the sun and the moon, making decay predictions an inexact science. It could vary from weeks to years, but NASA has not issued any re-entry predictions for W3B, according to Johnson. 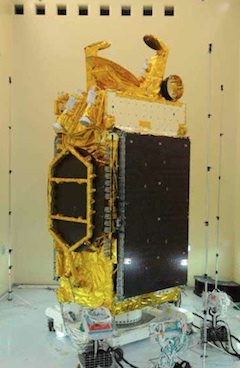 Eutelsat announced Oct. 29 it will soon procure a replacement satellite named W3D for launch in early 2013. The company plans to select a contractor for W3D soon, most likely before the end of the year.